I am happy to provide instrument inspection and service consultation free of charge. Often minor issues caught by a trained eye can be remedied easily and prevent more serious problems from developing. My goal is to exceed expectations with an open, honest and pressure-free experience, so that you can get back to making music! Please make an appointment today to visit the shop and find out how I can help you. Gluing Seams - The glue joint between ribs (sides) and back or top plate often opens partially during periods of dry or fluctuating weather. While a nuisance, this relieves tension that builds when these wooden parts shrink or expand differently, preventing cracks that might otherwise result. While gluing open seams is usually straightforward and inexpensive, usually the instrument must be left overnight to allow the glue to dry. Adjusting/Replacing Pegs - Pressing ill-fitted pegs too forcefully into the pegbox in order to make them stay put is not only hard on the wrists, it can cause costly damage. I guarantee I can make your pegs work like a charm! Dressing (resurfacing) Fingerboards and adjusting the string notches of the upper nut can improve playability and eliminate mysterious buzzing sounds. New Sound Posts and Bridges - These two elements are integral to sound production and should be installed by a professional Luthier. Repairs - Gluing and stabilizing cracks of all kinds, replacing broken corners, and refitting loose necks are just a few examples of typical repair procedures. I pledge to mend your instrument as affordably as possible without cutting corners. Restorations - More complex repairs such as Neck Grafts, Sound Post Patches, fitting new Bass Bars, correcting sunken plate archings using plaster casts, and doubling of edges (replacing the worn under-surface of the plate edges) are a few examples of the restoration procedures I have experience performing. Both my formal training as an instrument maker as well as my experience doing restoration work have instilled a deep respect for stringed instruments as historical works of art. It is my responsibility to restore an instrument's structural integrity and aesthetic beauty while conserving original material and honouring the original maker's intentions. Tonal Adjustments/Optimization - Often significant improvements in tonal quality, balance and playability can be achieved through Sound Post adjustment and minor corrections to instrument set-up. Troublesome "wolf-notes" can also be eliminated or minimized. Bow Service - I stock the finest quality Mongolian Stallion hair for rehairing of bows. Other services include replacing worn leather grips and faceplates. For beginning and intermediate players I offer a wide selection of student models to suit any budget, with all instruments meticulously set-up and adjusted in the Violin Atelier Schmidt workshop. Not sure if you're ready to commit to an instrument purchase? Our Rental Program (see below) allows you to get your feet wet without jumping in the deep end! For advanced students and professionals I have a selection of fine handmade violins in the shop - please make an appointment to try them out! 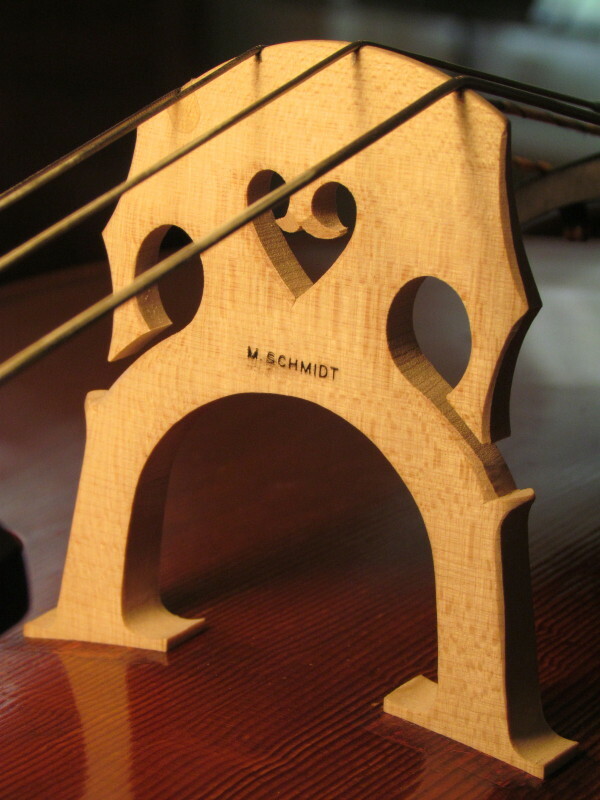 It is my desire and intention to offer customers a full range of high quality strings, accessory products and instruments; making Violin Atelier Schmidt a "one-stop-shop" for string players. If you are a teacher and have suggestions of string brands or other products that will be required regularly, please let me know and I will be sure to maintain these items on hand. Here is your opportunity to have a professionally crafted instrument made specifically for you! If you are not in a great rush and would value the opportunity to collaborate in the planning and witness step-by-step progress of the creation of your instrument, I would be pleased to meet with you to discuss the possibilities. Some images of my work as well as instruments for sale can be viewed in the gallery on the New Instrument Making page.